This post is part of a series that will explore making in elementary, middle, and high schools. The series is part of the Kickstarting Making in Schools project in which Children’s Museum of Pittsburgh will choose six schools to integrate making along with using Kickstarter, an online crowdfunding platform, to raise necessary funds for their projects. Over the past year, Avonworth Primary Center has been working hard to develop our makerspace and promote innovate thinking with our students and teachers. Our students love having the opportunity to build, design, tinker, create and share designs with each other. Last spring, I realized something else – parents are makers too. During a school-wide event, I asked if any parents were interested in helping with a design challenge. To my surprise, I had 20 parents sign up within 48 hours. This was the start of something exciting! This school year we have increased community support for our makerspace by building shared ownership for supply collection. Each homeroom (18 in all) are in charge of collecting a different consumable item throughout the year. All of students know their “special” item to collect and each homeroom has a specific place to store donations. This has created a sustainable method for collecting supplies that has kept our space fully stocked all year. A master list is included in our school newsletter so everyone is familiar with items we need. 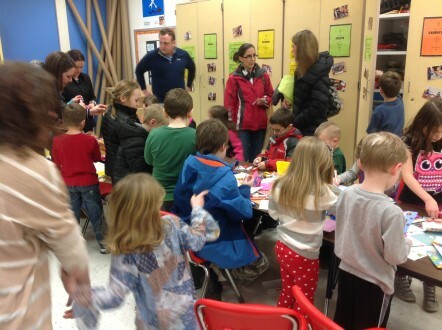 Since the students and their parents were excited about making – Avonworth PTA created a dedicated committee to help organize, staff, and promote our makerspace. This has allowed parents a way to come into our school weekly to volunteer their time and efforts in supporting the culture. This has created a group of making experts that support the lessons and activities in our makerspace. Since parents are part of the process, they have shared their stories of excitement throughout the community. Now, I have more parents and community members that want to come in and volunteer their time. At the end of the day, remember that we are all makers. Parents are big kids too that enjoy the ability to freely design new creations and build in a risk-free environment. Scott Miller is principal of Avonworth Primary Center (K-2) located in northern Allegheny County – part of the Avonworth School District. This school opened in the Fall of 2014 and features a dedicated Makerspace that is used by students, teachers, and the community as part an integrated curriculum approach.